2012 has been a great year for fantasy and sci-fi and The City’s Son by Tom Pollock is no exception to that rule. 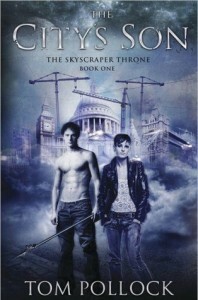 A brilliant young adult, urban fantasy novel published in the UK by Jo Fletcher Books. I was going to start off this review by writing that this was the best 2012-released young adult novel that I’ve read so far. Then, I recalled that Pantomime was a 2013 release, and the only other 2012 YA novel that I’ve read was the very disappointing conclusion to James Patterson’s eight-book Maximum Ride series, Nevermore. I hope to try and read some more YA novels in this month, particularly some of Strange Chemistry’s new releases, so we’ll see how it goes. But for me, The City’s Son was absolutely fantastic. It’s even better than some of the other, non-YA 2012 novels that I’ve read this year as well, which is saying something, considering that I’ve read over 200 books this year alone. This is a book that took me completely by surprise. Given the fact that this sounds all-too familiar to a Paranormal Romance novel, I wasn’t expecting anything like what I got. The prose is perhaps the most beautifully written that I’ve ever seen in a YA book since Phillip Pullman’s His Dark Materials. It’s got everything that you could want, and more, from a novel that’s brilliantly written, but also has brilliant cover art. Or the UK version at least. The US version… isn’t so awesome. The world is beautifully developed and expanded upon over the course of the book. Strong Urban Fantasy city-set novels make use of their setting and make you really feel like it could only be set in that particular city and nowhere else. Tom Pollock has this box ticked. Not only does Pollock manage to give us a sense to what London is really like, he also expands a lot on the city that we think we know. I remember reading somewhere that you can spend your whole life in London and discover new things every day. That is very true in The City’s Son, for it is a result of a wealth of imagination, brilliant world building and with a gripping storyline to boot. Now, the characters. Beth Bradley and Fillius Viae are the main characters in the book, and as a result they naturally get the most page time. Fillius is a charming character and they are both flawed and imperfect. What I like about this book is it takes time to establish the setting rather than throwing us straight into the action, showing us a sample of Beth’s life before she is betrayed and forced to run from her home. I am willing to agree that Beth accepted the discovery of this new world far too quickly, but that didn’t detract from my overall experience and is perhaps my only criticism of the novel. It’s interesting to see how they develop, and as the novel goes on, Pollock manages to prove that nobody is safe from his plotting, leaving me to wonder where the series will take us from here. This is an original take on urban fantasy that introduces a great new talent for the genre. Fans of Neil Gaiman, Ben Aaronovitch and Phillip Pullman will get something out of The City’s Son for sure. It’s a brilliant book, and expect this to be on my favourites list for 2012.